Look at the people in your life now. Who do you go to when you are in trouble? Who comes to you in times of trouble? 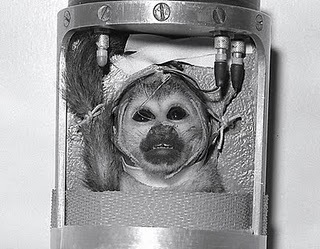 Trouble in this case isn’t necessarily mutant NASA monkeys returned from space to exact their revenge. Trouble comes in small unassuming packages as well. Trouble could be losing your engagement ring in a toilet. Trouble could be needing to know if you should break-up with your girlfriend after you catch her with another woman. Trouble could be getting kicked out of a bar when you are so far gone that you cannot remember how to walk. Trouble could be not knowing how to draft a cover letter. Those people – the ones you go to and the ones who come to you – they are your support system. When disaster strikes, these are the people you want to have around. If you are going to be a part of a group of intrepid survivors, they may as well be people you already know and trust. However, there is something you must know and prepare for now. You will be upset when The Inevitable happens. Beside yourself even. You will need to vent. You will need to talk to someone. You must have a person you can confide in. Without one you will not survive. At least, not psychically. Relieving stress and tension via conversation or activities with other people is an essential part of being a sane human. Call up your significant other, BFF, and whomever else helps you get through every day life. These are the people who should be in your fortress, shoulder-to-shoulder with you, firing on those mutant NASA monkeys! Who would be part of your support system and why? Tell us in the comments!